Yennai Arindhaal has undoubtedly fetched a good name for Ajith, as he went away from his tried and tested mass image and underplayed according to the demands of director Gautham Menon's script. The Australian cinematographer of the film, Dan MacArthur is much impressed with Thala, and this is what he had to say in a recent interview. 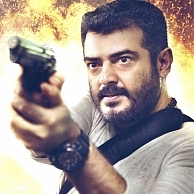 "Ajith is a very natural actor and he really understands his hero role. He is so experienced that he knows where I am with the camera all the time and he automatically works his action for the lens so I never had to tell him to turn this way or that. He knows that stuff so well and that made my life very easy. He was also always eager to try anything new and to listen to ideas and work that in if he felt it fitted with his character. He’s a very supportive and co-operative person to work with which makes him a joy to have on set. His patience and personality are truly remarkable. He expressed a lot of faith in Gautham's judgement." People looking for online information on Dan MacArthur, Thala Ajith, Yennai Arindhaal will find this news story useful.